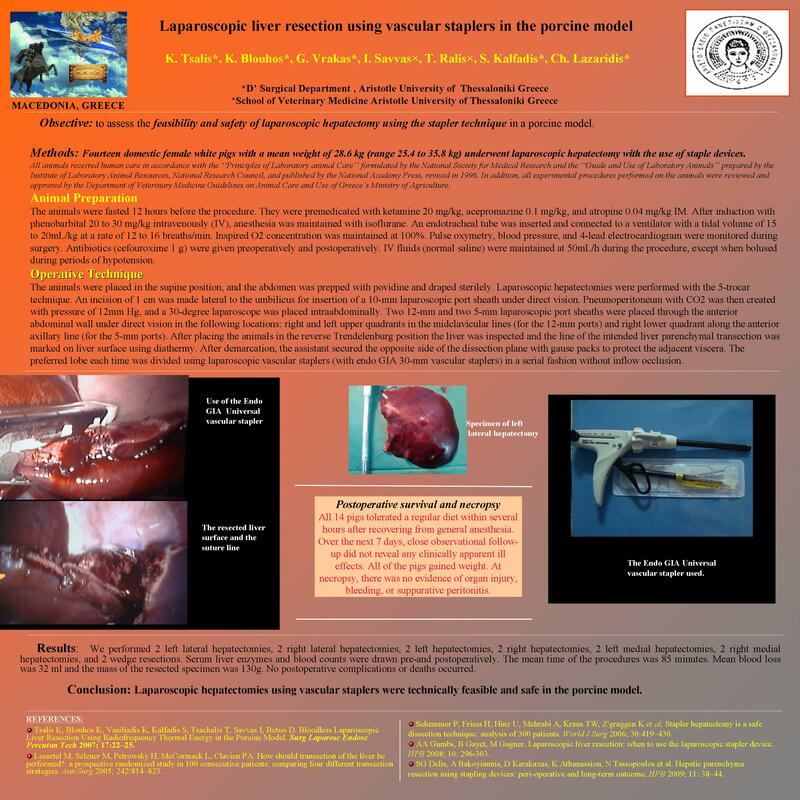 The aim of this study was to assess the feasibility and safety of laparoscopic hepatectomy using the stapler technique in a porcine model. Method: Fourteen female pigs weighting more than 25kg were used. Five trocars (10mm) were used for the introduction of the video camera and the other laparoscopic instruments. With the porta hepatis not clamped, the liver was inspected and the preferred lobe each time was divided using laparoscopic vascular staplers. We performed 2 left lateral hepatectomies, 2 right lateral hepatectomies, 2 left hepatectomies, 2 right hepatectomies, 2 left medial hepatectomies, 2 right medial hepatectomies, and 2 wedge resections. Serum liver enzymes and blood counts were drawn pre-and postoperatively. All animals were killed after one week. Results: The mean time of the procedures was 85 minutes. Mean blood loss was 32 ml and the mass of the resected specimen was 130g . No postoperative complications or deaths occurred.